After spilling small cereal pieces all over the aisle in our produce and grocery stores several time I started looking at more practical snacks. I love making quick and easy snacks for my munchkin. An even better snack idea is one that is perfect "at home" AND perfect to "take with you". I looked around for some granola ideas. Sweet oat snacks, how could you go wrong? Well, I saw some granola cluster recipes on Sally's Baking Addiction and Serious Eats that really inspired me, motivated and excited me about creating my own versions of granola. These Maple Almond Granola Clusters are our favorite granola. It is so good we eat about half the pan before it cools down! YUM! Enjoy. 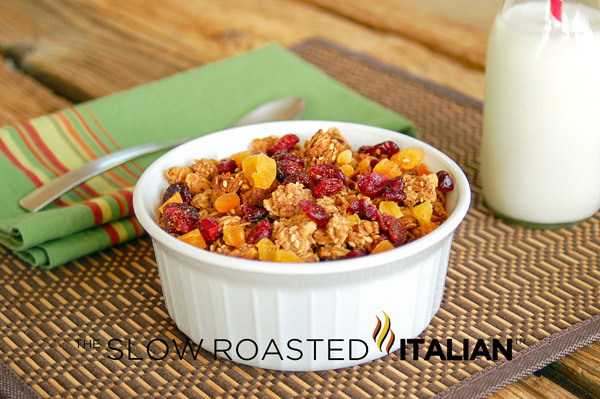 Spiced Honey Nut Breakfast Granola is loaded with fruit, nuts, cinnamon and honey. So delicious, it will disappear like magic. Line an 18 by 13-inch rimmed baking sheet with parchment paper. Set pan aside. 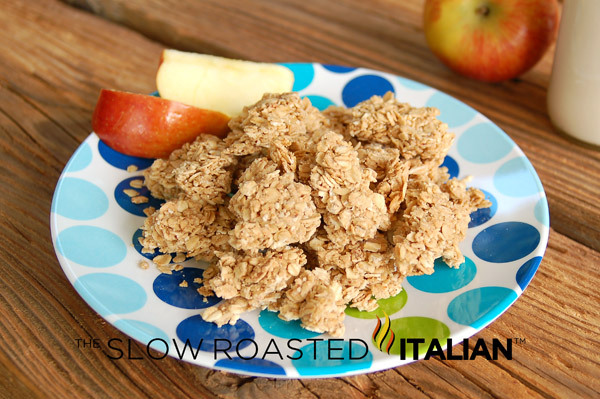 In large bowl, toss together oats, ground almonds, and salt. Pour canola oil evenly over the mixture. Stir with a wooden spoon to coat mixture evenly with oil. Combine maple syrup and brown sugar in a medium saucepan. Warm mixture over medium heat until the sugar dissolves, about six minutes. Gently stir the mixture frequently. Remove pot from the heat. Add vanilla extract. Stir to combine. Pour sugar-mixture over oat-mixture. Stir with a wood spoon to combine. At first, the granola will be thick and sticky. Continue stirring, breaking up any lumps of sugar/oats with the back of the wooden spoon, until the sugar-maple is evenly distributed. Press mixture very firmly into prepared pan. Bake until golden brown and aromatic, about 45 minutes. Remove pan from oven. Immediately score granola into bars. (The granola might break into smaller pieces when scored. This is fine.) Allow granola to cool. "Snap" bars into bite-size nuggets. Store granola in a covered container for up to two weeks.